After EU court rules to scrap trade deal with Morocco in 'occupied' Western Sahara, EU vows to petition and keep trading - why no label? A decision by the European Union's (EU) second highest court last Thursday has thrown into sharp relief the double standards Israel says are present in the EU labeling move against Jewish products from Judea, Samaria, eastern Jerusalem and the Golan Heights. Israel responded to the move by noting there are roughly 200 territorial disputes worldwide - including in Western Sahara in northern Africa - and yet only Jews in Israel were targeted by the EU. That case is likely to be strengthened after the EU General Court decided to strike down a 2012 trade agreement between the EU and Morocco in the Western Sahara, a region Morocco has occupied since 1976 when it was handed to its troops by Spain as it ended its colony there. The Sahrawi Arab Democratic Republic (SADR) holds a government-in-exile in Algeria, arguing for its rights to rule over the region. But instead of acting on the decision by calling to label Moroccan products from the region, EU foreign policy chief Federica Mogherini on Monday announced the EU will petition the ruling and in the meantime continue the trade pact, reports the Wall Street Journal. 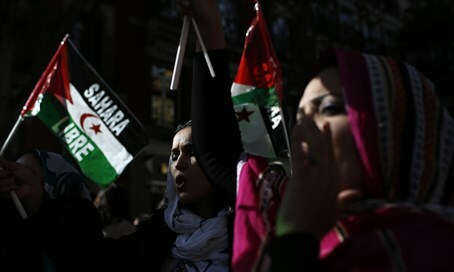 The court ruling came on a case brought by the Algerian-backed Polisario Front, a group fighting for independence in Western Sahara. In the decision, the court struck down the 2012 deal, that granted duty-free status to Moroccan agricultural and fishery imports to the EU from the region, in return for the eventual removal of tariffs on some European exports to Morocco. Trade in the deal between the EU and Morocco totaled a whopping 30 billion euros ($32.8 billion) last year. When the pact was sealed in 2012, Western Sahara activists argued it would boost exports from plantations in the disputed territory that are controlled by the King of Morocco and foreign companies. But Mogherini on Monday showed her concern over the "occupation" does not extend to Western Sahara, as she vowed the EU would make sure the trade deal remains in effect during a petition of the court ruling. She said the EU's "international commitments will be respected," and spoke of how important the ties with Morocco are. Moroccan Foreign Minister Salaheddine Mezouar on Monday told reports in Brussels that "this is a dangerous precedent. It is not useful to a relationship (with the EU - ed.) which has been built up step by step with determination for more than 20 years."